A person’s surrounding environment and support network play important roles during recovery from addiction and substance abuse. Families who attend group therapy and counseling sessions together can enhance recovery by helping to foster a supportive home environment. Participating in a self-help or peer support group can be highly beneficial for individuals during recovery as well. Studies published by Scientific American show that attending self-help group meetings regularly improved abstinence rates for individuals who were considered problem drinkers. Family, peer, and community support groups are often a standard part of recovery. They often serve as part of long-term aftercare for addiction, following a comprehensive substance abuse treatment program, the National Institute on Drug Abuse (NIDA) reports. Support groups include traditional self-help and 12-Step programs like Alcoholics Anonymous (AA) as well as many sub-groups and alternative programs that cater to a range of people and circumstances. In addition to providing a supportive environment where individuals in recovery can feel safe and connected, support groups provide a platform for people to share their story with an empathetic and understanding crowd. Membership is kept confidential, protecting individuals’ privacy and encouraging participation. Support groups offer positive peer pressure, and members can help each other identify potential triggers for relapse and potentially prevent a return to drug or alcohol abuse. Members of support groups are all working toward a common goal, and these groups provide a sense of belonging and community to individuals who may have felt socially isolated or been surrounded by unhealthy influences due to substance abuse. People’s support networks can influence their continued sobriety, and support groups can help individuals avoid relapse, Psych Central publishes. One of the original, and perhaps most well-known, self-help groups is that of Alcoholics Anonymous (AA). Alcoholics Anonymous has more than 2 million members around the globe who attend meetings in 170 different countries. There are more than 115,000 AA groups, the National Council on Alcoholism and Drug Dependence (NCAAD) publishes. Considered a mutual-help and peer support group, AA follows the 12 Steps for recovery. These steps are spiritual in nature and encourage members to work through them in order to take responsibility for their own actions, apologize to loved ones they may have hurt as the result of their addiction, and develop principles for living a life free from alcohol and mind-altering substances. AA provides fellowship for people from all walks of life and is open to anyone who has issues with problem drinking. There are several offshoots of AA that are specific to certain demographics of people or those suffering from addiction to other substances. Cocaine Anonymous (CA), for example, is a separate 12-Step program with meetings tailored to individuals battling cocaine addiction, while Narcotics Anonymous (NA) is for individuals struggling with an addiction to prescription opioids, heroin, or other narcotic drugs. Crystal Meth Anonymous (CMA) and Marijuana Anonymous (MA) are community-based nonprofit organizations that provide support to individuals struggling with issues related to these specific illicit drugs. Traditional 12-Step groups are spiritual and center on placing faith in a higher power. They are not generally secular, but they are nondenominational and open to anyone. These groups have only one requirement: that a person desires to be completely drug- and alcohol-free. These groups believe in complete abstinence for recovery. Groups meet in a variety of locations and at many different times in an attempt to provide services to as many people as possible. New members are often paired up with a more veteran member who acts as a “sponsor.” A sponsor is available to the sponsee 24/7 for additional support and emergency help when needed. Traditional 12-Step groups may not be for everyone. Even though they are not affiliated with any specific religion, they are spirituality based, and religious individuals are more likely to attend than nonreligious people, the Journal of Substance Abuse Treatment states. Some people may find a nonspiritual approach to benefit them more. For these people, other support groups may be more desirable, like SMART (Self-Management and Recovery Training) Recovery. These groups employs a “Four Point Program” that is based on building an internal motivation to change, controlling impulses and cravings, regulating thoughts and behaviors, and living a healthy and balanced life. SMART Recovery groups meet for 60-90 minutes during a basic meeting or an advanced meeting, both of which work through a predesigned outline that encompasses steps such as check-in, agenda setting, work-time or discussion, “pass the hat,” and checkout or closing. Like AA, these groups do not charge members, but they do ask for a donation through a collection, via “pass the hat.” Advanced meetings may spend more time on the “Four Points” than basic meetings, have a half-hour socialization time beforehand, and may assign homework. SMART Recovery meetings are led by a facilitator. SMART Recovery also has online community that hosts daily meetings and has live chat rooms available 24/7 for individuals needing additional support. With traditional 12-Step programs, principles are based on the fact that addiction is a disease and individuals must learn to recognize that their substance abuse is out of their control; therefore, people must give the control over to a higher power. SMART Recovery programs focus more on self-empowerment and the development of tools to be more self-reliant. These are akin to methods used in Cognitive Behavioral Therapy (CBT). There are additional groups that offer support for addiction recovery that are not as steeped in spirituality as AA. Secular Organizations for Sobriety (SOS) is a research-based program that also works toward self-empowerment. SOS believes spirituality and religion should be separated from concepts of attaining and maintaining sobriety. The only requirement for membership in an SOS group is that the individual wants to become sober and abstinent from substance abuse. SOS principles are based on honesty, openness to everyone, and not being influenced by outside factors such as religion. There is no cost to join these groups, and no sign-up process is required for support group membership or meeting attendance. Support groups are open to anyone regardless of their race, ethnicity, gender, sexual orientation, financial status, or age. There are even dedicated groups that cater to specific demographics, such as women, adolescents, or those in the LGBT community. Treatment facilities as well as medical, mental health, and substance abuse providers can provide more detailed information on local groups. 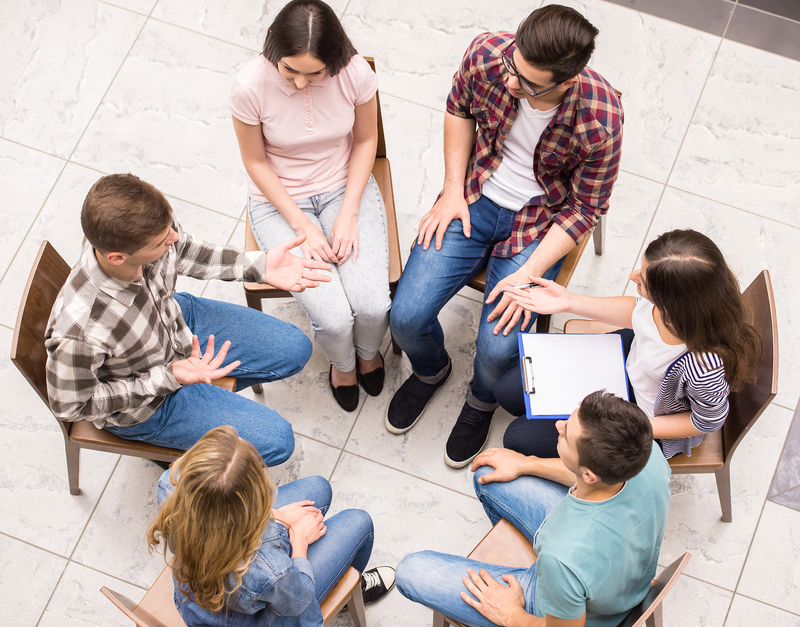 Support groups provide a positive environment where individuals battling addiction, or a problem with alcohol or drugs, feel connected to other people with similar experiences. Meetings are flexible, confidential, inexpensive, and welcoming, providing individuals with a sense of belonging and a group of people who truly understand what they are going through. The right support group can open the door to lifelong friendships, fellowship, and ongoing support throughout recovery.